Superstorm Irma at 185 mph bearing down on the islands. PEMBROKE PARK, Fla. – Hurricane Irma remains a Category 5 storm Tuesday as the Caribbean starts to feel the effects of the hurricane as it also remains a threat to South Florida. As of the 5 p.m. advisory, Irma was moving west at 14 mph with sustained winds of 185 mph and 220 mph gusts. By late Tuesday afternoon, Irma was close to making a pass at the northern Leeward Islands in the next few hours. 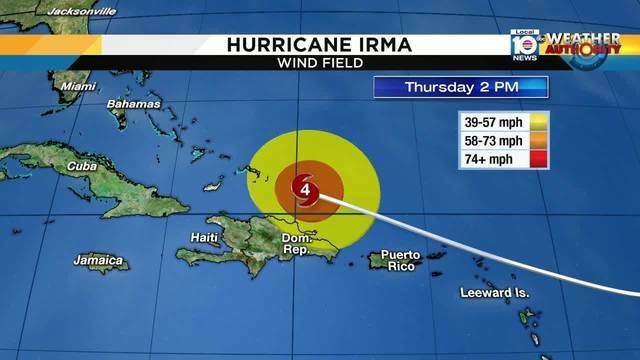 All of South Florida remains in the cone, although the new forecasts show the storm slowing as it reaches close to the mainland. 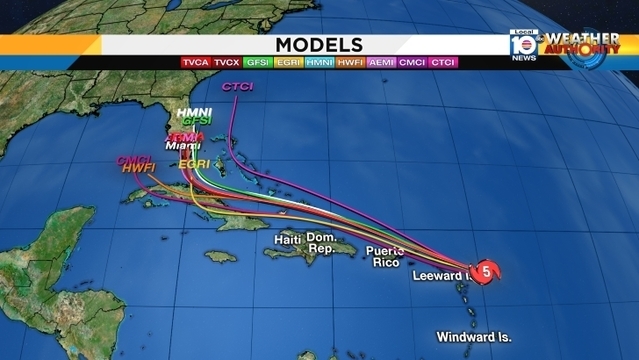 Almost all models show Irma making a northerly turn and heading somewhere near Florida. 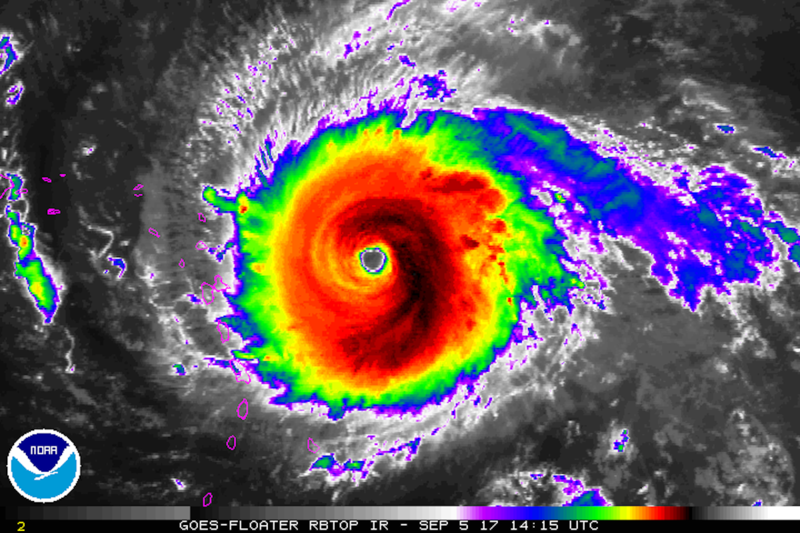 Although some fluctuations in intensity are likely in the next few days, forecasters are calling for Irma to remain a major hurricane and take a turn to the west-northwest Tuesday night. Mayfield warns people to not focus on intensity because if it hits, it will be bad no matter the strength. Hurricane warnings have been issued for several Caribbean islands, including Puerto Rico and the Virgin Islands. The core of the storm is forecast to move over or near portions of the northern Leeward Islands by Tuesday night or early Wednesday. 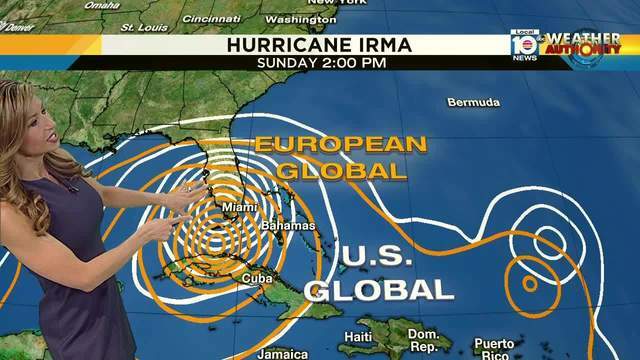 Local 10’s Julie Durda said South Florida should begin to feel the effects of Irma by Friday. “Nobody can tell you exactly where that northward turn is going to occur,” Local 10 News hurricane specialist Max Mayfield said. Mayfield said the wind field is forecast to expand as it gets closer to Florida. “Don’t forget that the storm-force winds, if they extend out 200 miles away from that center, well then, you know, we’re going to feel the impacts way before this center gets close to us,” Mayfield said. “It’s too soon for specifics on landfall or specifics on the impact, but you should definitely have a plan and be ready to act,” Local 10 News chief certified meteorologist Betty Davis said. Download the Local 10 Hurricane Survival Guide and The Max Tracker mobile app for iOS and ANDROID. Copyright 2017 by WPLG Local10.com – All rights reserved.